NIghtwings kisses. dog.... HD Wallpaper and background images in the Young Justice club. are there spoilers in it?!! If robin's birthday is in december, when he kissed Barbra, and new years eve is when Zatanna kissed him. Wouldn't Barbra be his first kiss? 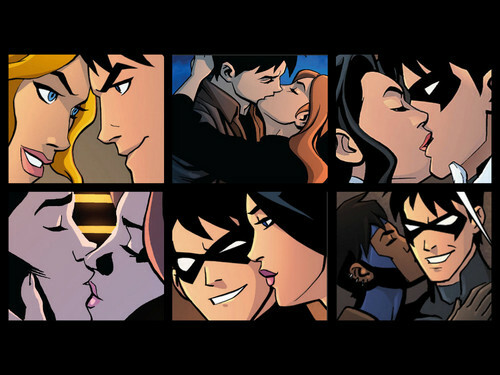 I wish i was babs at that moment, that kiss looked awessumm ;_;! Seems a little awkward too. Won't all the girls hes kissed and "done" something to them be jealous, angry or something? @brown-eyed-girl : totally. that's what i ship. that and birdflash.